This grilled steak, both hot and cold at the same time, is a surefire winner! Score steak on both sides with shallow cross-cuts; place in shallow dish. Mix A.1. and 1/2 tsp. red pepper until blended. Pour 1/4 cup over steak; turn to evenly coat both sides of steak. Refrigerate 30 min. to marinate, turning after 15 min. Meanwhile, refrigerate remaining A.1. mixture until ready to use. Heat grill to medium heat. 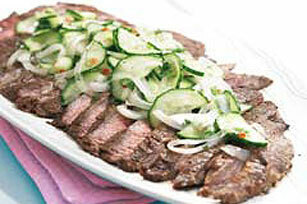 Remove steak from marinade; discard marinade. Grill steak 17 to 21 min. or until medium doneness, turning and brushing occasionally with remaining A.1. mixture. Meanwhile, combine remaining ingredients. Transfer steak from grill to cutting board. Let stand 5 min. before cutting across the grain into thin slices. Serve topped with cucumber salad. Prepare as directed, using a skirt steak and decreasing the grilling time to 10 to 13 min. or until steak is cooked to medium doneness. Marinate steak as directed. Heat broiler. Place steak on greased rack of broiler pan. Broil, 3 to 4 inches from heat, 8 to 10 min. on each side or until medium doneness, brushing occasionally with remaining sauce. Overly heated grills will overcook or char meat, poultry or fish before the interior reaches the desired doneness. Check the owner's manual for specific grilling information.